Torre del Lago Puccini, a part of the municipality of Viareggio, famous worldwide for its unique beauty and where the Pucciniano Festival takes place, an International music festival that each summer attracts opera lovers from all over the world. 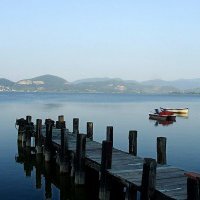 Immersed between Lake Massaciucoli and the Tyrrhenian Sea, the Apuane mountains and San Rossore Migliarino Massaciuccoli Park, Torre del Lago Puccini is an ideal starting point for those who want to discover or visit the wonderful landscapes and nearby historical towns of Tuscany. Famous also for its beaches and the presence of numerous restaurants and discos, Torre del Lago Puccini presents in its territory several monuments and places of interest which deserve to be visited, amongst these: Villa Borbone, residence of Maria Luisa of Borbone, positioned inside a vast park, built starting from 1822 and retouched several times in the course of time; Villa Puccini, where the great composer spent the last years of his life; St.John’s Church, where it is possible to admire the magnificent frescoes painted by Lanfranco Orlandi; and the great open theatre where each year the Pucciniano Festival takes place. Relais Villa La Bianca Bed and Breakfast di charme a Camaiore in Toscana.